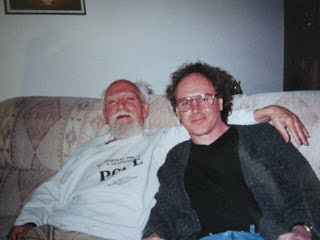 Robert Anton Wilson and Michael Johnson, Feb. 18, 2003, in Wilson's apartment. The new edition of Email to the Universe currently being prepared for publication by Hilaritas Press and scheduled to be released soon has a nice bonus: A new introduction by Michael Johnson of Overweening Generalist fame. 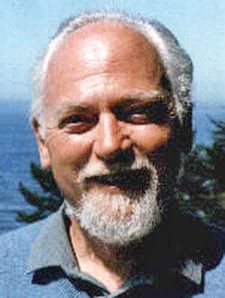 If you are not familiar with the story of how Email to the Universe came to be assembled as Robert Anton Wilson's final book, see my interview with Michael. RAW did not do a good job of keeping copies of his work. Michael Johnson and his helpers, such as Mike Gathers, did a heroic job of gathering up much of Wilson's uncollected material and making it available at the Robert Anton Wilson Fans site, which remains one of the best RAW sites on the Internet. Many of the best pieces posted there were included when Email to the Universe was assembled. Richard Rasa, director at Hilaritas Press, says Johnson's piece is “the Intro we think the book always needed.” I have read it, too, and it's an excellent piece, a nice bonus for people who buy the book. Hot dog. I can't wait to read Dr. J's intro. Great news! Congrats to Michael, that's awesome. Oh wow, just now seeing this. Thanks for the notice, Tom!